Original garment by the artist. 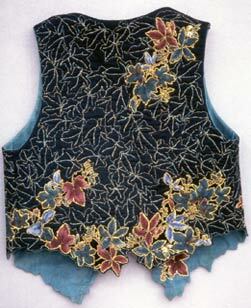 Machine appliquess of leaves are edged with heavy gold thread embroidery. 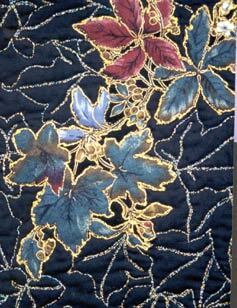 The same threads are used to quilt leaf shapes in the background areas. This was an experiment in both bobbin drawing and in making an un-even edge to follow a pattern. 100% cotton. 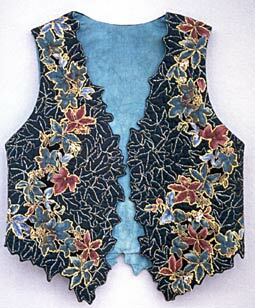 Commercial and hand-dyed fabric by the artist were used. Copyright 1998 by Barbara Barrick McKie, all rights reserved.